It's not a secret that I am a huge Kate Morton fan. I discovered her many moons ago when I picked up a copy of The Shifting Fog at my local bookshop based almost solely on how gorgeous its cover was. The story inside was the perfect mix of mystery and history and magic, and I was soon engrossed in the tale of two sisters and a poet, and the tragedy that linked them all. I declared myseld an avid fan, and was even lucky enough to get a reply to an email I sent to Kate full of encouraging words for my fledgling writing career. (Which remains fledgling to this day.) In 2010 when The Distant Hours was first published, I bought myself a copy of it in hardback because I simply could not wait for the inordinate amount of time it was going to take for the book to come down in format, and later that same month I toddled off to a literary luncheon with my mother at which Kate discussed her books with Verity James. Since that time, a new Kate Morton publication has been an event to anticipate with great glee, and this year millions of Morton-ites will be able to unwrap a brand new novel at Christmas time (or before then if they can't wait) when Allen and Unwin published her fifth book entitled The Lake House. The story begins in 1933, when Theo Edevane is snatched from his cradle on the night of the annual Midsummer's Eve Party at Loennaeth, a lake house in Cornwall. While a huge police investigation is mounted, no trace of the boy is ever found, and before long the Edevane family pack up their things and move to London, never to return to their beloved home. The Lake House is a thrilling page-turner, and may just be Morton's best work since The Shifting Fog and The Forgotten Garden launched her as an Australian publishing sensation. Full of twists and turns, this novel owes a lot to the study of the traditional whodunnit, and its great skill lies in the way the reader is coached into making interrogative leaps using the evidence they have gathered, only to have more equally likely scenarios become plausible just when it feels like the game might be up. While the novel does exhibit some classic hallmarks of the romantic genre, such as coincidences which could only be believed in fiction, and lucky clues seeming to fall into the detective's lap at times, Morton weaves her web and catches her reader in thrall-- they do not care if the scenario is unlikely, for it is so entertaining, and in context feels so completely right. 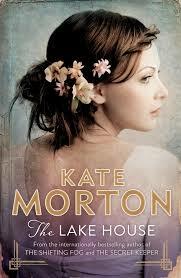 When you are reading a Kate Morton novel, you are under her spell. She creates fully realises worlds and peoples them with intriguing characters, plotting them with such precision, and all the nostalgia of the golden age of Hollywood. While at times her writing edges towards becoming somewhat cliched and adjective heavy, the flow of her prose works extremely well over time, and this 500 plus page tome was the work of a few days. Quite simply put I could not put it down. Morton's work has just reached a milestone, selling more than 10 million copies worldwide and it's no wonder. The Lake House is sure to become another bestseller but facts and figures aside, it is a sensational novel and I only regret that I may have to wait another two years for another like it. The Lake House is available to pre-order now at your trusty local bookshop. Great review. I really enjoyed this one as well! Morton's certainly able to draw readers under her spell.